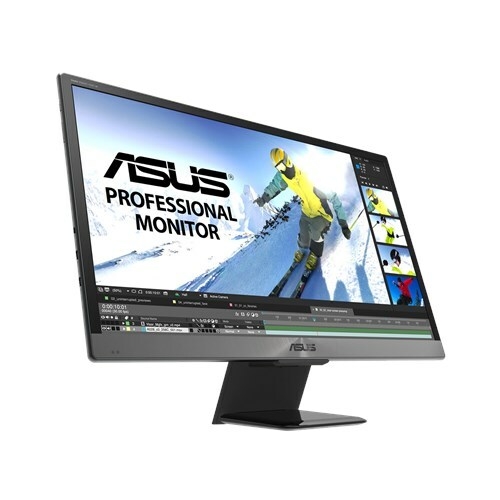 With its new mobile 21.6" OLED 4K (3,840 × 2,160) monitor, Asus is targeting professional users in terms of picture quality (and price). The Asus ProArt PQ22UC covers the professional color space DCI-P3 almost completely (99%) by using OLEDs and supports a color depth of 10-bit as well as the HDR10 standard (but with a maximum brightness of only 350 nits). It is intended to serve a notebook as a portable, lightweight professional monitor that can be easily taken along due to its design and then connected via a single USB-C cable and powered without the need for an additional power source. It has two USB-C ports and a microHDMI input, a very good contrast ratio of 1,000,000:1, a short response time of 1 ms (grey to grey) and comes with a stand and a folding monitor stand designed for travel. The Asus ProArt PQ22UC will cost around 5,000 euros and will be launched at the beginning of March. It will be the first portable OLED monitor on the market.